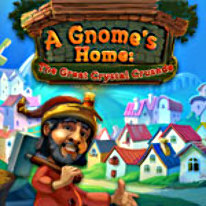 Help gnomes to return the magic crystal and rebuild their underworld kingdom! The underworld gnomes kingdom was happy and rich under the shining of the magical crystal. But one day an evil witch stole the crystal and now the gnomes kingdom lies in ruins. The underworld king is waiting for a brave one who can challenge the mighty witch and return the peace to a kingdom. Your path lies through the different lands. You will face different obstacles - and different persons. A couple of gnome workers will help you to walk this long and hard path to gather the magical artifact, reach the lands of evil witch and defeat her to return the magic crystal and rebuild underworld gnomes kingdom. -A lot of different and interesting tasks. -Fairytale story created by your gameplay.